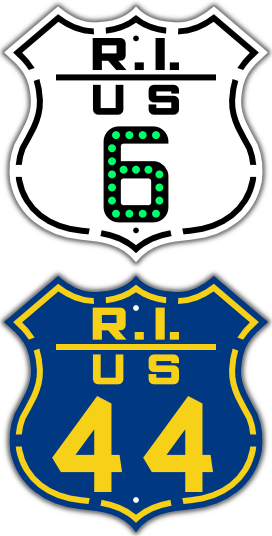 Rhode Island shield with MUTCD fonts. Cutout U. S. shield, with Rhode Island custom fonts. The sign is 16 by 16 inches. Available with any route number, in color or black and white, and with optional glass cateye reflectors. Rhode Island U. S. shields available in traditional white with black legend, and various colors, as used by that state.